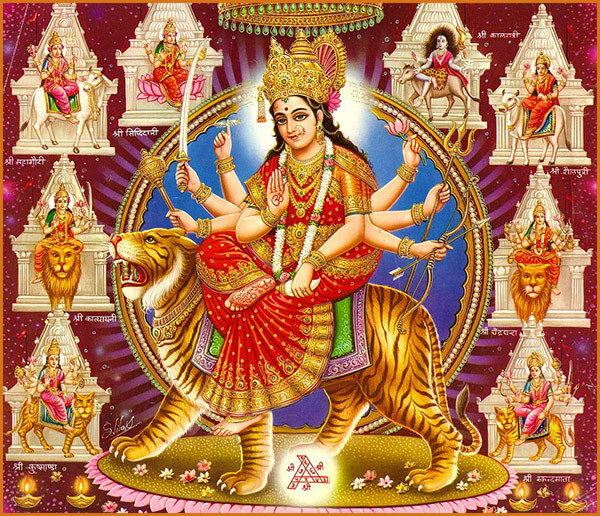 The Navratri festival is the nine days celebration to honor the Mother Goddess. Mother Goddess (Universal Mother) is embodiment of Unlimited Love, Compassion, Courage, Mercy, Righteousness, Abundance, Prosperity, Forgiveness and Wisdom. She is also called Shakti – Divine Power. She protects mankind from evil and misery by destroying evil forces (negative energy and vices – Arrogance, jealousy, prejudice, hatred, anger, greed and selfishness). Nav-Durga is considered to be the most auspicious period. During this period, nine forms of Supreme Conscious Energy (Shakti/Devi), the female aspect of divinity are worshiped though, singing her glories,meditating and praying to her for good health, prosperity, purity of mind (remove our negative behavior, vices), love, peace and bliss, “Sat Chit Ananda.” It is said that since lot of people pray during that time, the collective energy becomes very powerful and prayers are often heard. When we meditate and pray to Universal Mother, we must ask Her to use Her destructive power to destroy all imperfections and faults, and purify us to become a receptacle of her Divine Shakti and Blessings.